Retro kid's fantasy "Turbo Kid" is ironically frustrating because it accomplishes everything it myopically sets out to. Here's an homage to '80s pop culture that justifies its nostalgia for a bygone era of kitschy popular entertainment by critiquing modern-day assembly-line technology/entertainment. "Turbo Kid" is for anyone whose eyes light up at the very mention of '80s cult action-adventures like "BMX Bandits," cartoons like "Jem and the Holograms," and video games like "Mega Man." The film is, in that sense, the ultimate fan film since it monotonously aggregates previously existing scifi/fantasy tropes. Rejoice, Gen X viewers, for now you can uncritically enjoy your childhood's junk food culture just because you're looking at the past through the rose-colored lenses of the future. 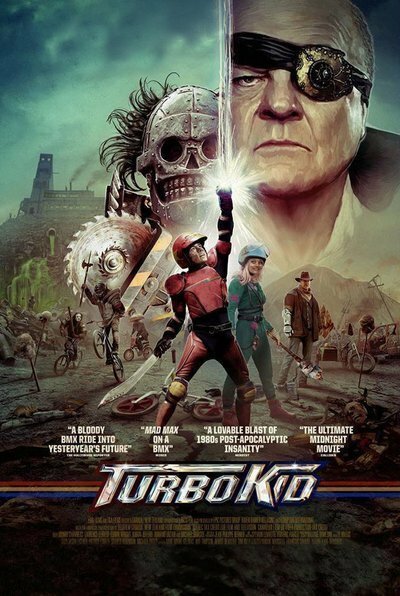 "Turbo Kid" begins with deliberately cheesy voiceover narration that relates the film's paint-by-numbers nuclear dystopia scenario, then declares: "This is the future. This is the year 1997." That info is dumped in viewers' laps after a hexagonal company logo that looks a lot like Cannon Films' signature emblem pops up, and a dorky synth power ballad plays over the film's opening credits (the chorus: "You can light the dark when they hear your heart of thunder."). "Turbo Kid" further implores viewers to enjoy relatively eccentric pop detritus of yester-year by setting its narrative up as a jokingly gritty wish-fulfillment narrative. The Kid (Munro Chambers) is a comic-book-obsessed orphan who survives by trading items he scavenges for necessary supplies. The Kid's world is ruled by one-eyed despot Zeus (Michael Ironside), a cruel baddy who rules his people with the help of Skeletron (Edwin Wright), a mute, saw-blade-wielding heavy. So it's no wonder that the Kid worships, and subsequently dons the costume of Turbo Man, a superhero armed with a red helmet, shoulder and knee pads, and a laser blaster operated by a Power-Glove-style keyboard. The Kid is joined in his anti-Zeus campaign by Frederic (Aaron Jeffrey), a duster-clad arm-wrestling champion, and Apple (Laurence Leboeuf), an unfailingly chipper android (more on this shortly). Since The Kid is the audience's surrogate, we see the film's world as a post-modern world without rules: everything is awesome because every story can involve parts of any story. So when Zeus taunts The Kid with a shocking act of violence, and bluntly exclaims "There are no rules that can't be rewritten," that's actually a line of thought that The Kid eventually embraces. The Kid even parrots Zeus later, exclaiming "Playtime is over" before he fires his video-game-style arm-cannon at Zeus. That line is supposed to be ironic since "Turbo Kid" is consistently soaked in blood and guts. Characters get hacked up, disemboweled, impaled, and generally treated like sacks of pulpy meat. That heedless disregard for human life even extends to an unnecessarily grisly flashback concerning The Kid's dead parents. Seeing mom and dad get sliced and stabbed in ostensibly surreal/funny ways is supposed to remind viewers that nothing is sacred any more, and that their childhood isn't what it used to be. But beyond some effective gross-out violence, "Turbo Kid" isn't really more mature than its raw generic parts, nor is it clever enough to disarm viewers who want to regress to childhood without feeling guilty for that naive impulse. Which brings us to Apple, the Kid's most constant companion. While Apple's identity as an android is revealed within the film's first half-hour or so, I've chosen to highlight Apple's robot character because she is the spirit of the film. The Kid even expresses skepticism on behalf of the viewer by saying "I thought all robots were evil," to which Apple responds "Depends on the model." This exchange makes more sense as an act of self-justification later in the movie when Zeus reveals his pre-apocalyptic function as an enforcer of evil "corporate policy." "Turbo Kid" teaches viewers that it's okay to worship the recreational products of yesterday (Check out Apple's dope headbands and eye-liner!) because, uh, she's not Zeus, the face of assembly-line, anything-goes corporations. Apple is chipper, and happy, and made to please, and she will win you over, gosh darn it! Too bad products and their attendant brands are not loyal to anyone, no matter how old they get, and the past isn't inherently better just because you've conflated your childhood with amiably cheesy knick-knacks of the not-too-distant past. "Turbo Kid" may be aimed at adults, but its infantilizing vintage fetish makes an otherwise cute action-adventure a bad blast to the past.